2/4: The date of my birth. 24: The number of the years I turned. In the U.S. we say “Happy Birthday” but in Indonesia the greeting, “Selamat Ulang Tahun” translates to, “Happy Repeated Year!” I never thought much about the difference in specificity between the two greetings – one emphasizing a single day, the other emphasizing the end, or beginning, of an entire year – until I discovered that many of the teachers at my school don’t know their birthdays. This came up over coffee the other day, when a lull in the conversation led me to share, “Tomorrow is my birthday!” For a while the conversation spun off into my plans and “target year” for getting married, a topic which really ought to be on my mind now that I’m 24 and approaching old age (at least for an unmarried Sasak female). But then both of the teachers I was with told me something shocking: “We don’t know when our birthdays are!” they exclaimed. These men, born in the late ’60s and ’70s, told me that they are part of a generation whose parents were illiterate and thus could not record the date of their birth. They explained that in these cases, the Indonesian government just chooses December 31 as the birthday for all official documents. Sure enough, the next day I examined the giant “teacher information board” that hangs prominently in the teacher’s room and counted at least a dozen teachers whose birthdays are recorded as December 31. I suppose that if a birthday is just the mark of another year, repeated, any date would do. It’s really just a number, after all. 2: The number of cakes involved in birthday festivities. The first was a surprise from my students. As I opened the uncharacteristically closed doors of class X2, 40 smiling faces yelled “Surprise! Happy Birthday Miss Lily! !” A few girls held out a glowing cake and others threw confetti. Camera phones (usually contraband) were taken out from their secret hiding spot in the inside pockets of backpacks, and we cut and ate cake together. In true Indonesian birthday style, a few students smeared some icing onto my face; we had an all-around good time. The second cake was devoured on our porch. As I rode my bicycle and turned down our little street, I could see a few kids standing at our gate (“standing lookout” I later learned from my roommate). As I approached I heard a countdown, “3,2,1…. Happy Birthday Miss Lily! !” All my neighborhood friends (average age: 7) were standing on my porch under a homemade banner of birthday. Three of the kids — Femi, Ainun, and Tari — played “Happy Birthday” on their accordions, a song I’ve been hearing them perfect – on Sunday mornings at 6 a.m. – for months. My heart warmed. I tried to run around giving everyone a big birthday hug but they all ran away screaming, probably because I was covered in flour and raw eggs. During istirihat, or break time, two of my students came to find me in the teacher’s room to wish me a happy birthday. One of them gave me a present and the other informed me that my present would be ready after school and that I should come find her before I went home. I felt so touched and kept telling them that they didn’t need to give me anything! To some this might seem like a cruel way to treat a birthday girl, but the tradition started to make sense to me on my bike ride home. I take the same route everyday to and from school. I wave to the same lady selling eggs and ignore the persistent cat-calls from the same group of cigarette-smoking boys at the motorcycle repair shop. 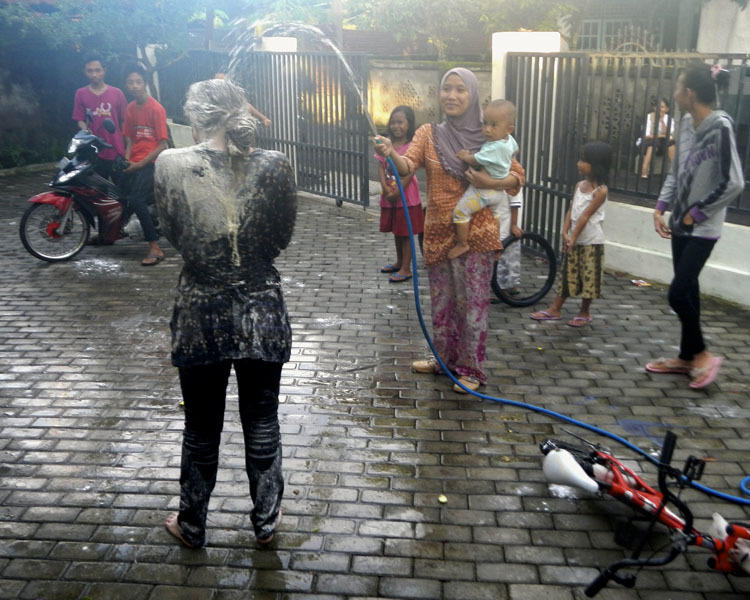 But that Monday, as I biked covered from head to toe in flour, everyone clapped as I passed by and wished me a “Selamat Ulang Tahun!” The fact that I was covered in flour immediately brought joy to everyone I encountered and immediately signified that it was my birthday. So though I don’t ever try to attract that much attention (most of the time I try to detract attention), I understand why tepung (flouring) is actually enjoyed by those subjected to it. Because one “flouring” wasn’t enough, about five minutes after I got home my neighbor Yanti and some of her friends (all 12th graders at my school), came over carrying a plate full of cakes. They grabbed a hose and drenched me in water, followed by flour. It was quite a spectacle. 4: The number of times I’ve soaked my clothes to try and get the flour out. About the author: Lily Wiggins is a second-year Fulbright English Teaching Assistant based in Praya, Lombok. She served her first Fulbright year in Pontianak, West Kalimantan. Wiggins graduated from Pitzer College in 2011 with a bachelor’s degree in sociology. Contact her at lilyfwiggins@gmail.com. I loved this story. What a beautiful memory to carry with you! Ive lived in Jakarta for nearly 5 years now, and I hadnt heard of this custom. I love it!